The last Saturday of Jun, we went for Aelig's school year-end festival. I learnt that if it is a private catholic school, it is called "Kermesse", and if it is a public school, it is called "la fête de l'école", meaning the school festival. These year-end festivals are meant to mark the end of school year while raising some money to finance the school activities including field trips. Around March, the kids started having rehearsal for their stage performance. 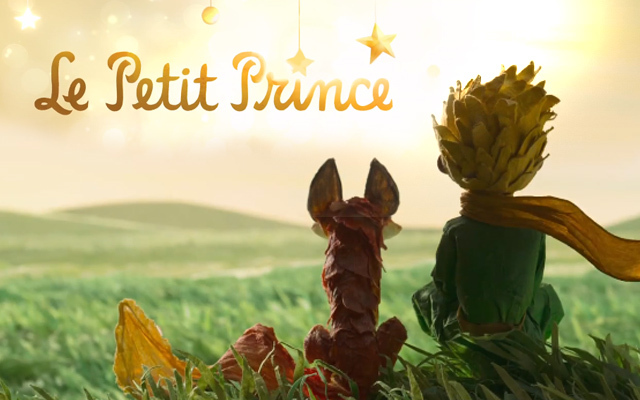 This year, the dances were designed around the theme "The Little Prince". It is such a clever idea, as the film will be released this summer, now parents could tell their kids that the film is related to their stage performance. The woman raising her right arm was the dance teacher. She designed all the dances and the costumes. Not very school has the budget to hire a dance teacher, some schools have their teachers handling the performance. In the photo, the kids dressed as The Little Prince, with green shirt and orange scarf (in our book at home The Little Prince is more wearing a yellow scarf than an orange one, maybe every book is different?). This is the scene where The Little Prince asks the pilot "Please draw me a sheep?" His rose. While these roses were beautiful, it was painful for the kids who had them around their head. The Little Prince ventured outside of his planet, he met the king. Aelig's class was splitted into two groups: one as snake and one as fox. She was in the snake group. She already showed us her dance at home. I almost told her The Little Prince died due to the poisionous snake, but I figured it would be better for her to figure it out herself. Afterall, the film is coming out on 29 July, she could have chance to watch it. I told her about this film, she has been waiting for it. We brought her to cinema yesterday, she thought she was going to watch it, but instead if was another movie. Since then, she has been asking, when are we going to watch The Little Prince? Jun was the month where most of the schools have their year-end festival. We went to tour around town one Saturday and attending two of them. One school had Disney characters dance this year. Those in green dress must be Thinker Bell? I was not sure. This one was from a public school, their performances were simpler, but they had more interesting games. Back to Aelig's school. Beside the stage performance, the school also prepared some stands (at the far edge in this photo). Schools sell coupons to parents, they can then use them to play games or buy food (sponsored by parents). Some games are simple yet creative, for example on the photo, Aelig was using a broom to push a round shape thing into holes at the other edge. They would win something if they succeed. Overall a fun day for the kids. It is also a good way to raise money. I think Malaysian schools could use this model. Instead of asking parents to directly donate money to the school, they could raise money through students / school / parents participation. PS : The stage performance continued on The Little Prince theme, but we went for games (hubby was holding a game stand), so didn't have photos for the performance after Aelig's. Here schools also have funfair to raise money by selling coupons which can be used to buy food and drinks.